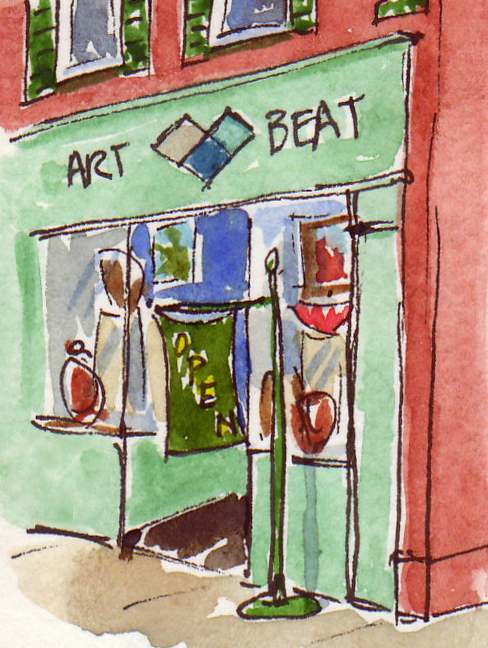 Artbeat gallery will be showcasing the sketchbooks of regional artists for three weeks in May at their Waynesburg, PA, location. The exhibit will give viewers a glimpse into the artists' creative process - a peek behind-the-scenes to see the planning and work that goes into creating an original work of art. 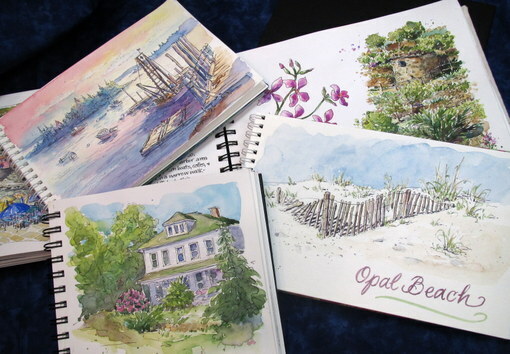 While many artists use sketches as a stepping-stone to a larger more detailed piece of work, others see the sketchbook as an end in and of itself. 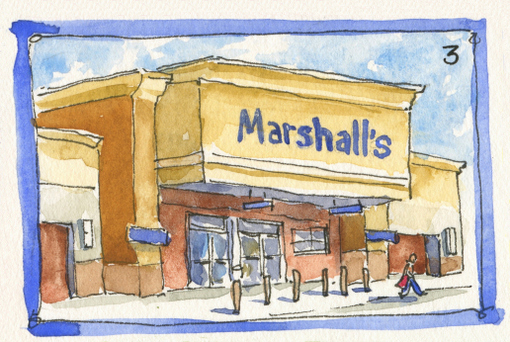 For them, the sketchbook is the work of art. 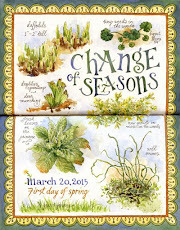 Both approaches will be featured at "Between the Covers". 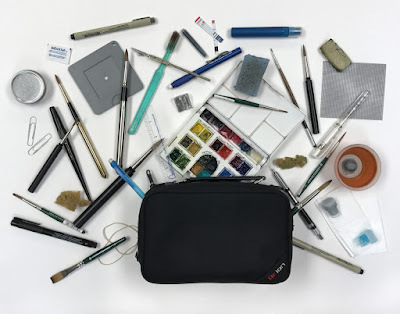 You'll see sketchbooks filled with everyday sketches and preparatory drawings, thumbnail sketches, and sketches that look more like finished paintings. 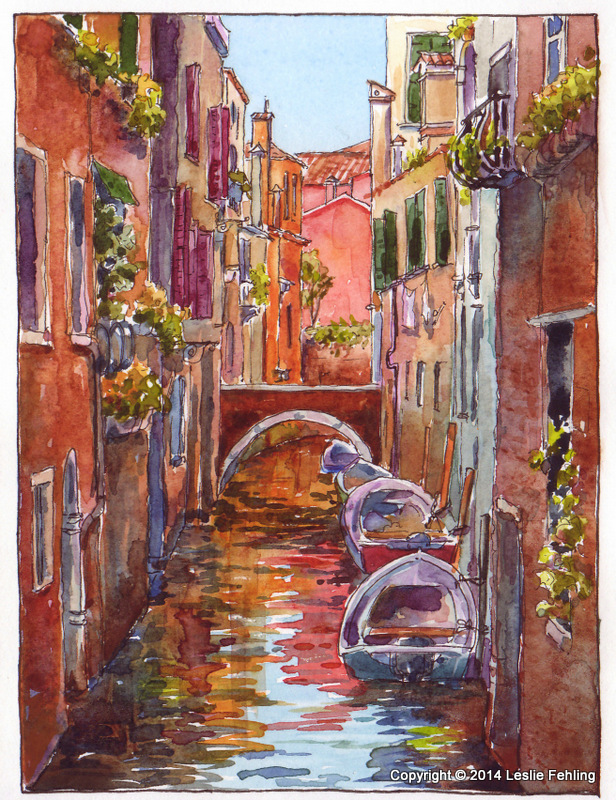 Subject matter will include everything from barnyard animals to Venetian canals. 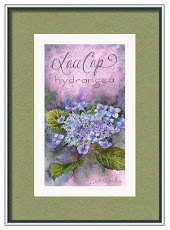 Styles vary from loose and impressionistic to detailed and realistic. 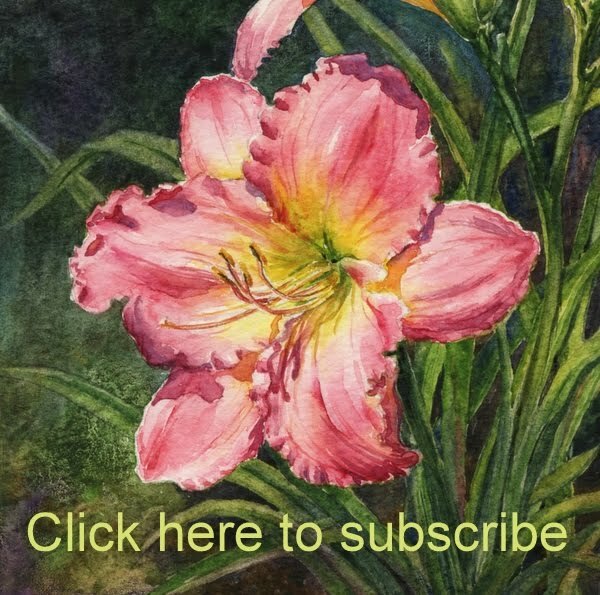 Get to know the artists as they talk about what inspires them and how they do what they do. This will be a chance to ask those questions that you've always wondered about.Some of the artists will even be demonstrating their art and techniques at the opening reception. I'll be there, along with other Artbeat artists and several of my students whose work has inspired me. We'll have artists with a lifetime of experience, and others for whom this is a whole new adventure. I hope you'll support them by coming out to see their work. The show will run through May 31st. 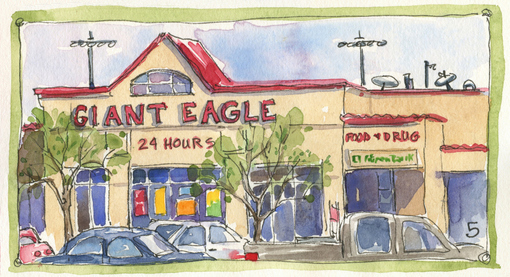 Artbeat is open Monday thru Friday 10 am - 5 pm, and Saturday 10 am - 4 pm. 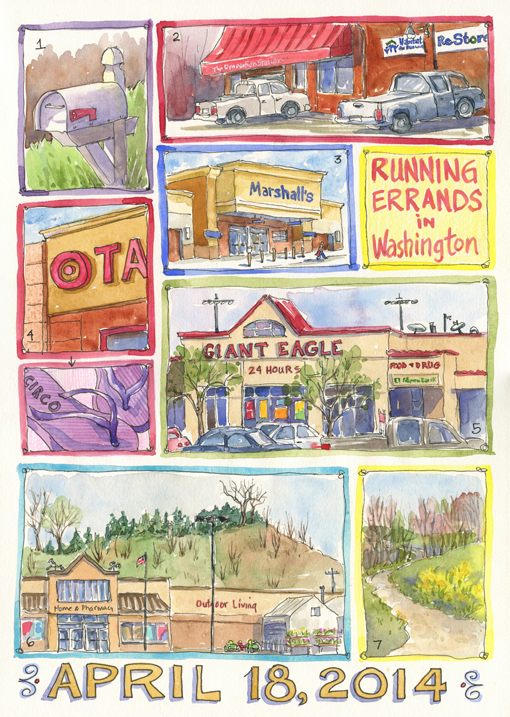 I'd much rather be home than spending my time visiting fifteen different stores in an afternoon, so the other day, when I had a long list of places I needed to go, I thought I'd give myself a reward for each one I checked off my list. 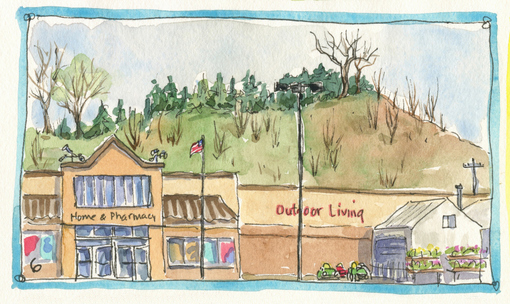 I took a few extra minutes at many of the stops I had to make to do a quick little sketch in my Aquabee 9" x 12" sketchbook. 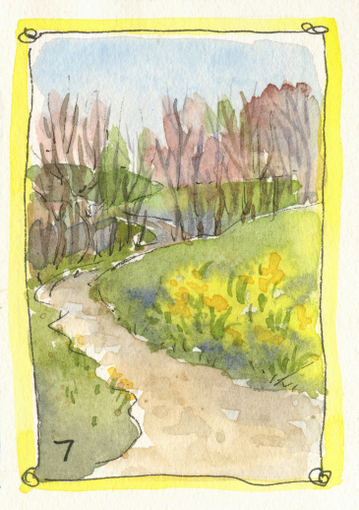 I drew and painted on site, from the front seat of my van, and only had to add a few finishing touches later at home. And it belongs to the most adorable baby in the world! 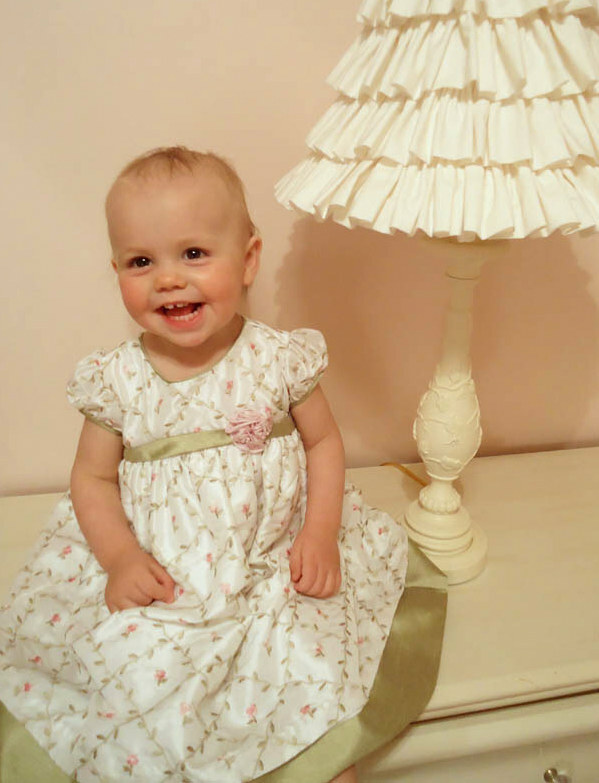 That's my granddaughter, Callista Rose, just 18 months old . She's the sweetest, cutest, funniest little girl, and I just love her to pieces! 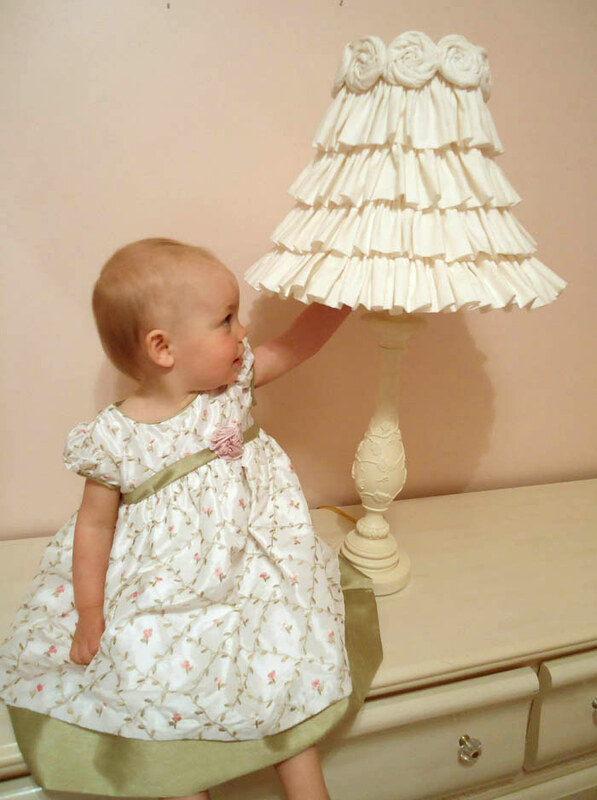 When her mom was decorating Callista's new bedroom, she wanted to refurbish the worn lampshade on a white "Shabby Chic" style lamp, so we searched the internet for ideas for making a ruffled lampshade. When we couldn't find exactly what we wanted, I designed one that would look just perfect in Callista's room. 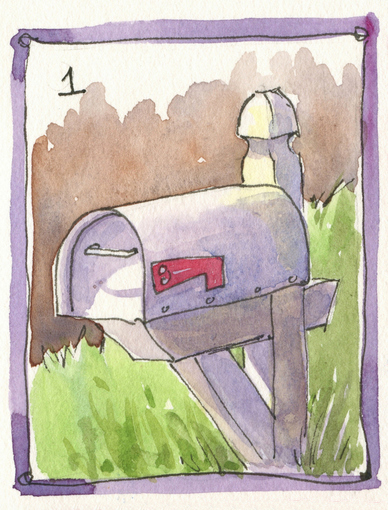 It's feminine and pretty, but not too shabby and messy-looking. 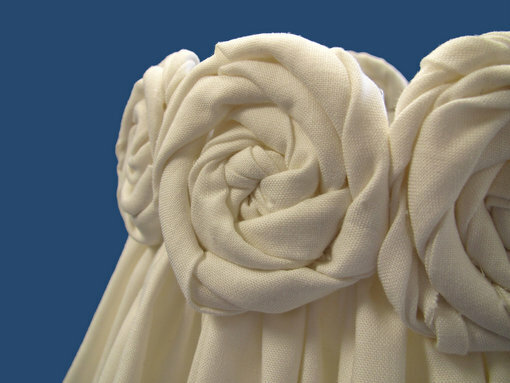 Ivory cotton fabric gives it the understated look we wanted, and the fabric roses encircling the top add just a hint of elegance. 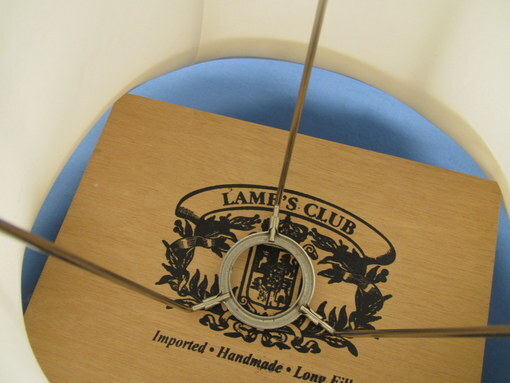 Start with a lampshade that's in need of a facelift. 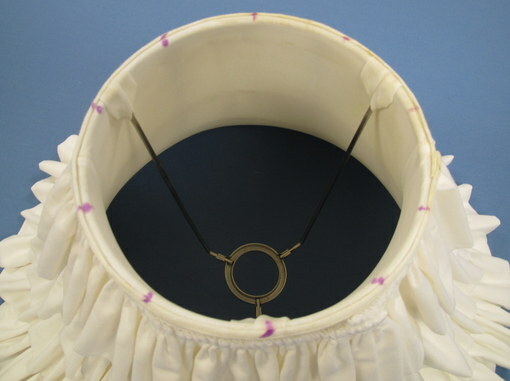 This one measures 6" top diameter, 13-1/2" bottom diameter, and 10-1/2" high. 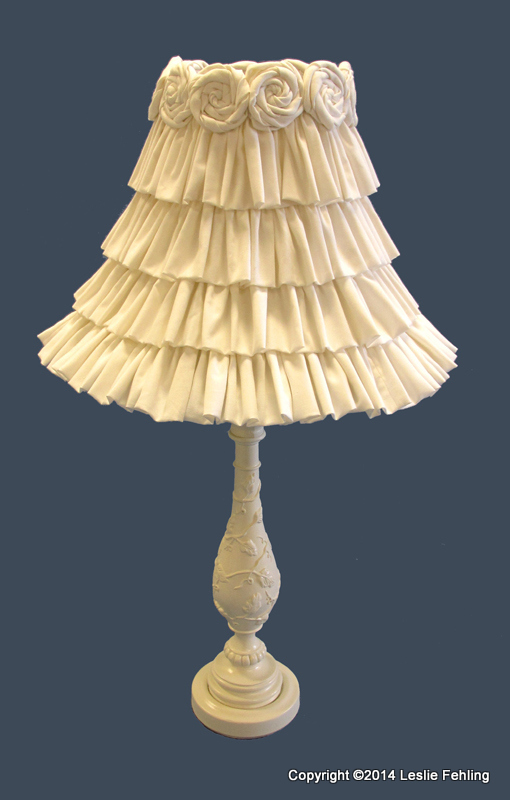 Decide how many ruffles you want on your lampshade. 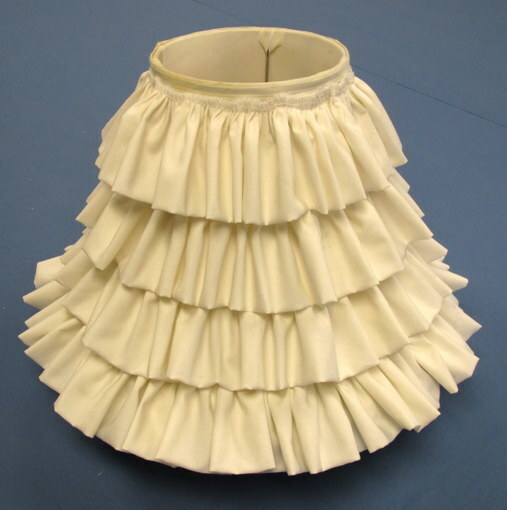 This one has four rows of ruffles. 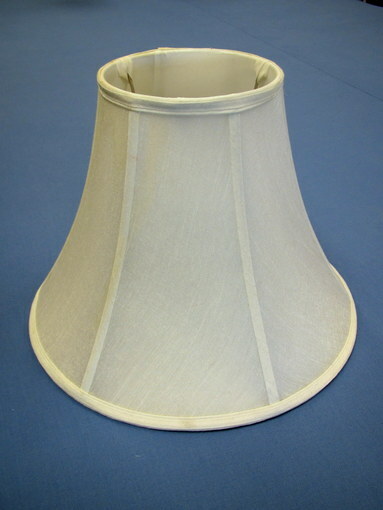 The height of this lampshade is divided into four sections, each 2-1/2" wide. I allowed a 1/2" space at the top for the area where the roses would be glued on. 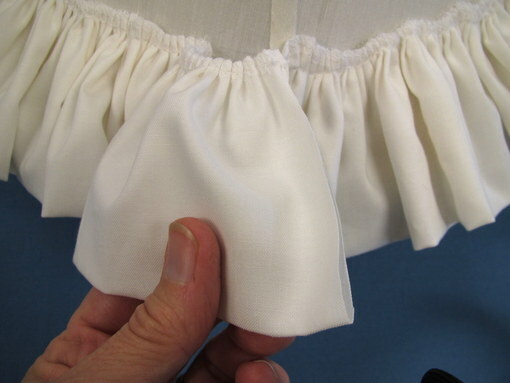 The cut size of the ruffles will take into account seam allowance and overlap, so don't worry about it at this stage. 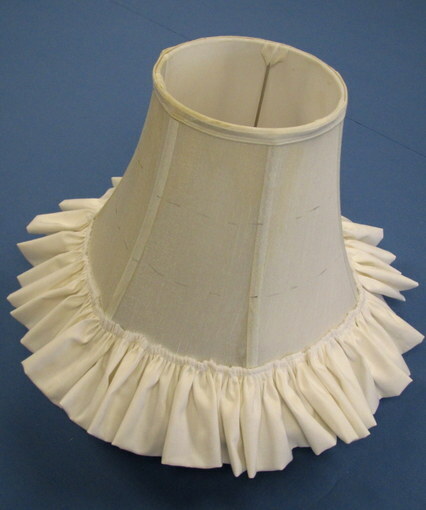 Make a paper template for marking the ruffle lines on the lampshade. 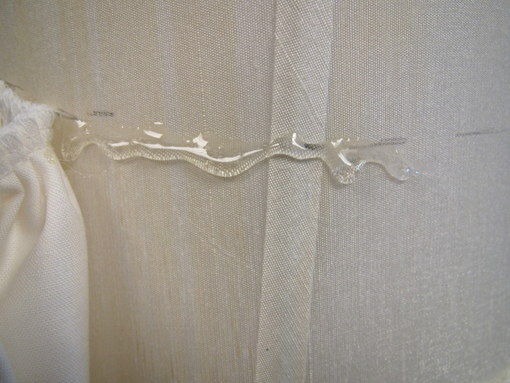 Put a few pieces of rolled masking tape on the back side to help hold it in place on the shade. 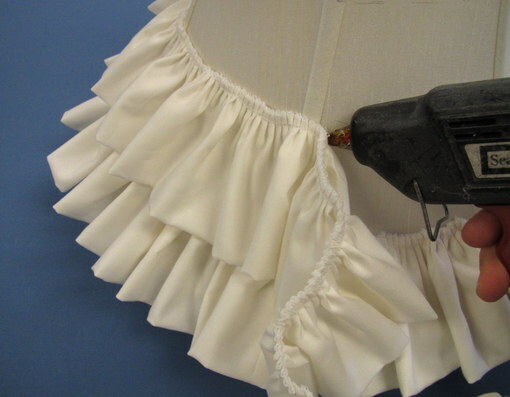 Position the template vertically on the lampshade and mark ruffle placement lines every few inches, all the way around the circumference of the shade. 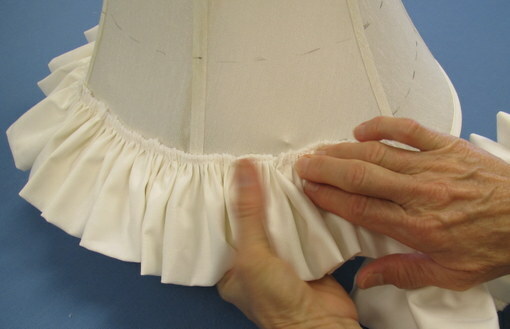 Place intermediary lines between your initial marks, so you'll have a continuous line for aligning ruffles on the shade. 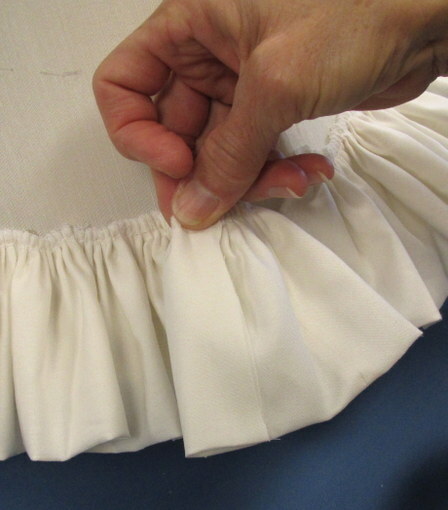 Each ruffle is made of a double layer of fabric, so multiply the finished ruffle size times 2 to determine the cut width of your ruffle. 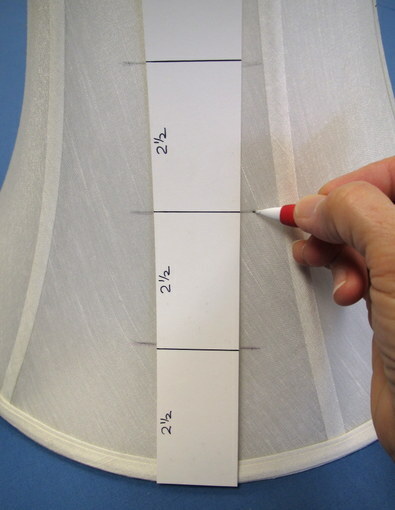 Measure the circumference of the shade at each of the marked ruffle placement lines. 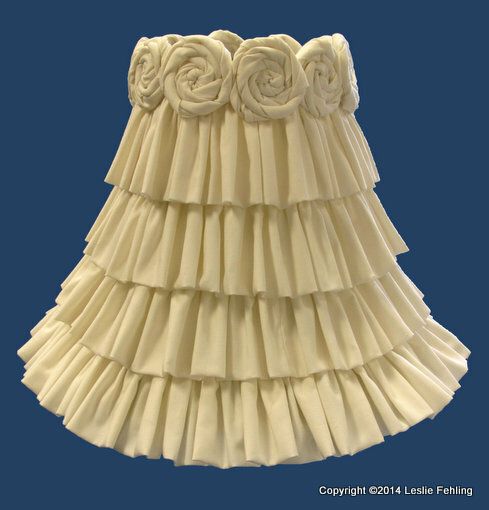 Add them all together to find the total ruffle length needed. 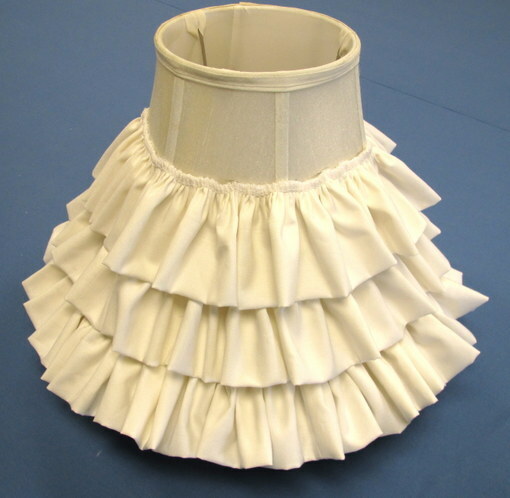 Ruffles need to be gathered to 3X fullness. 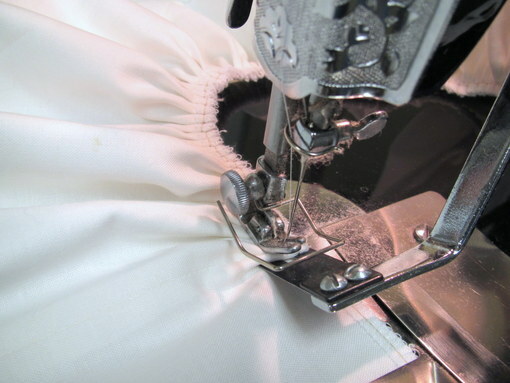 Using the CUT WIDTH measurement, cut the required number of ruffle strips. 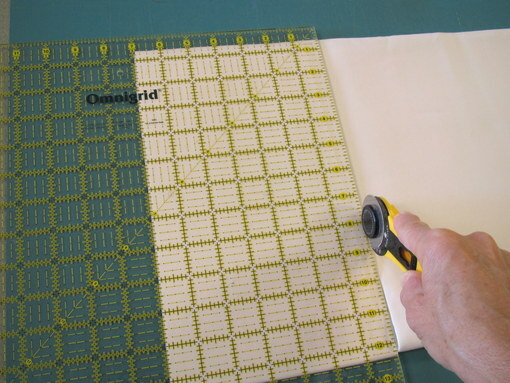 I used a rotary cutter and Omnigrid ruler - it's quick and accurate. 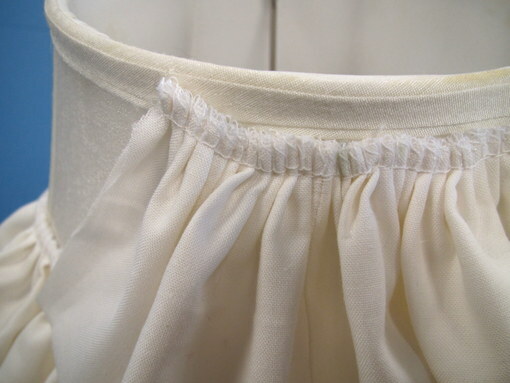 The fabric I used was an off-white Kona cotton. 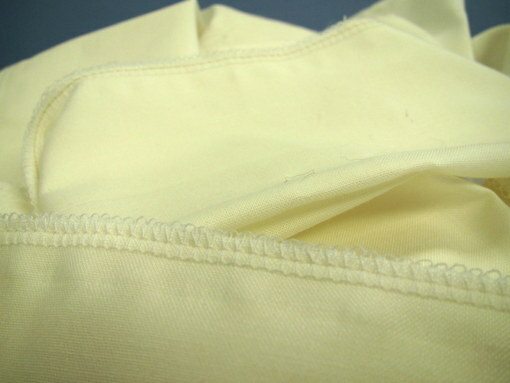 Seam the ruffle strips together with a 1/2" seam on the short ends of the strips. 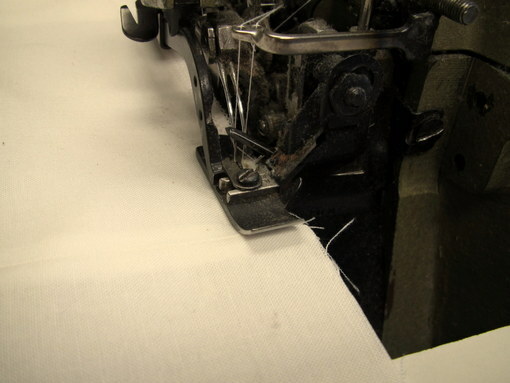 Trim off the selvage to reduce bulk in the seams. 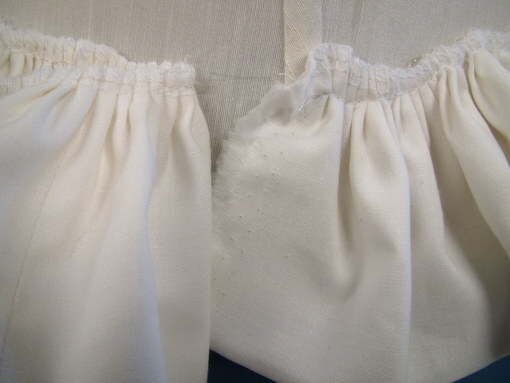 Fold seams in half lengthwise, wrong sides together. 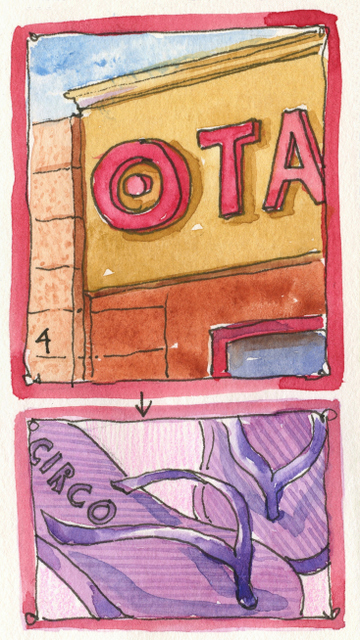 Pin, if desired. Serge the raw edges together. 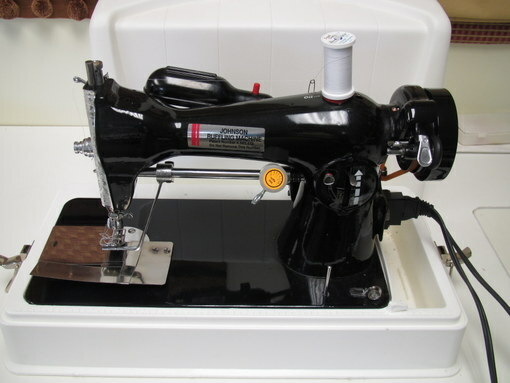 I used a Johnson Ruffler, which makes short work of this time-consuming job. 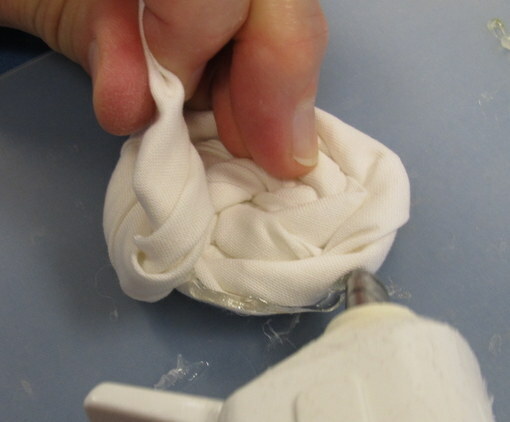 Use a ruffling attachment made for your sewing machine. 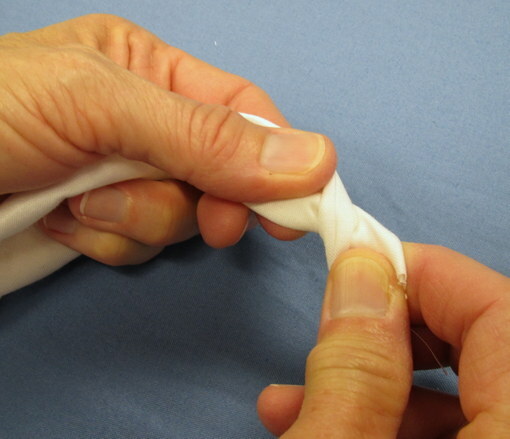 Zigzag over dental floss using a wide stitch width and long stitch length. 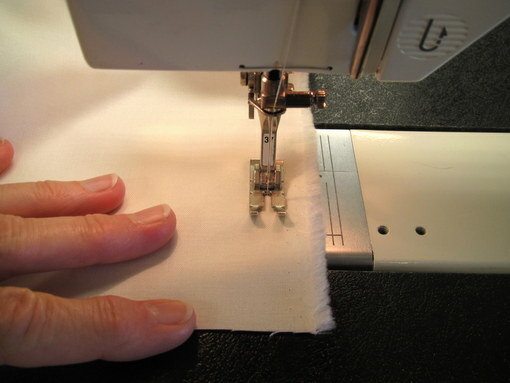 Sew a basting stitch 1/2" from the raw edge of the folded strips. Sew another row of basting 1/4" from raw edge. 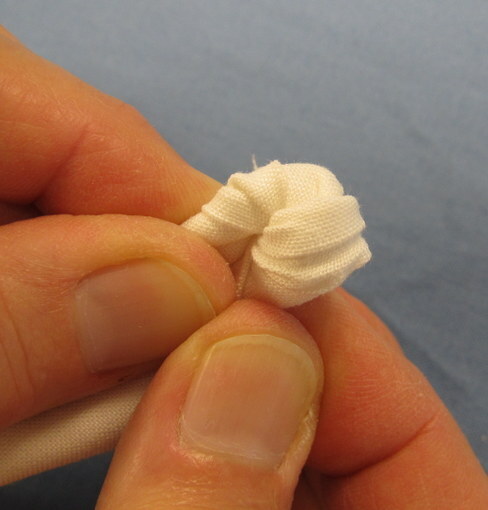 Pull the threads on one side of the folded strip to gather to 3X fullness. Prop the shade up on something which will support the fitter. 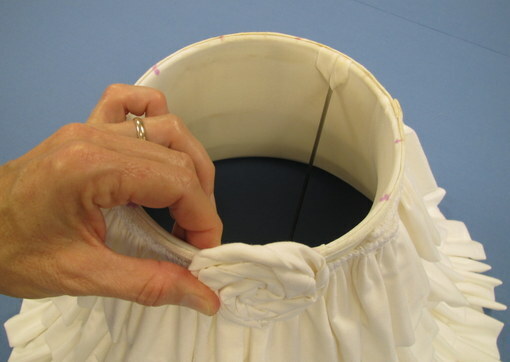 This will keep it off the table and prevent the bottom ruffle from getting wrinkled as you work. Begin gluing the bottom ruffle in place just below the placement line. I used high-temp hot glue, as I think it tends to hold better than the low-temp variety. Don't apply too much glue. A single bead is enough. 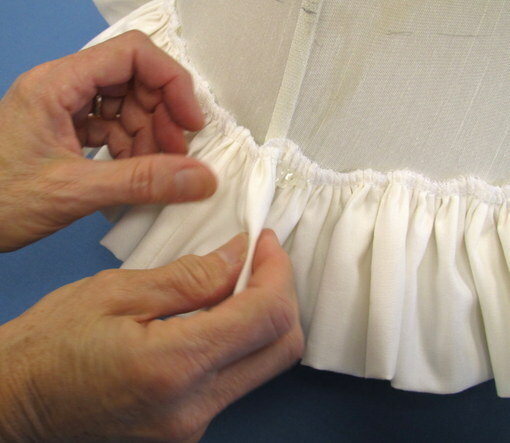 Work quickly to press the serged edge of the ruffle into place before the glue cools. 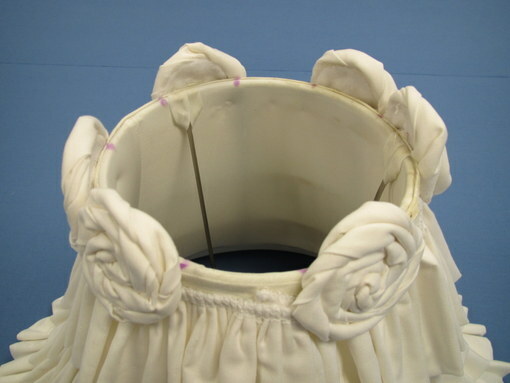 Hold the ruffle in place as it cools. 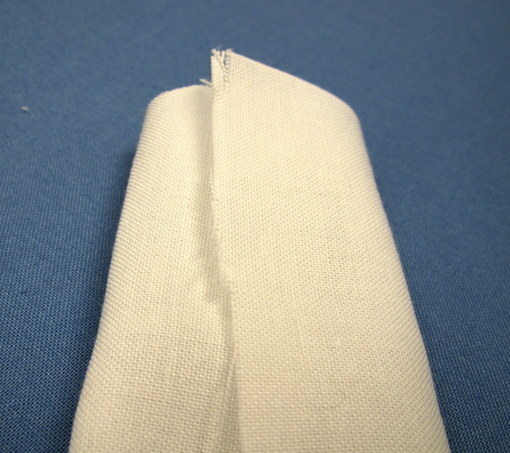 Angling the beginning of the ruffle strip up slightly will help to prevent the raw edge from showing at the bottom. 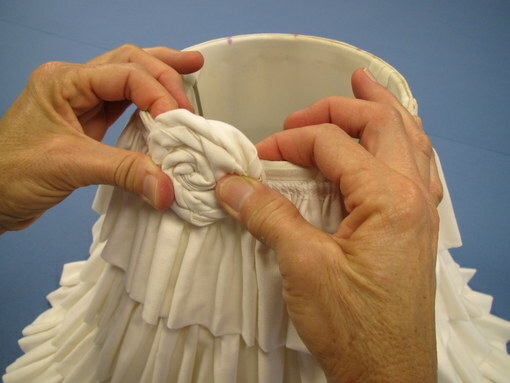 To finish the end of the ruffle, allow an extra 1-1/2" for turn-under and overlap. 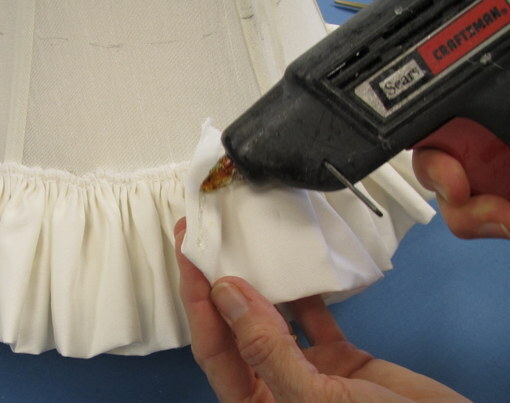 Apply hot glue to the back of the ruffle end. 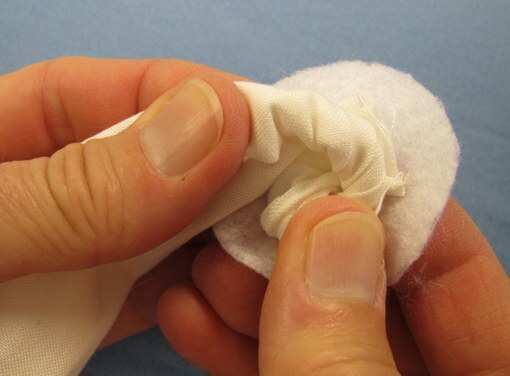 Fold about 3/4" to the back side of the ruffle and hold it in place as it cools. 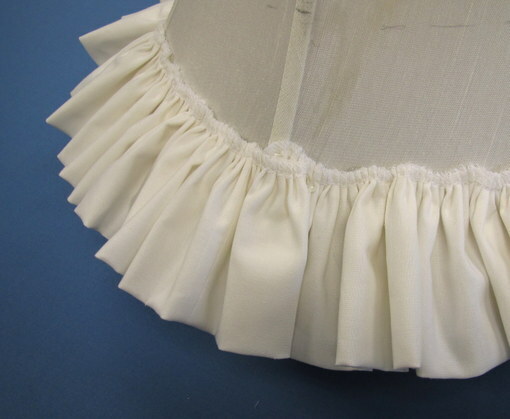 Glue the finished end over the point where the ruffle started. The first row is finished! 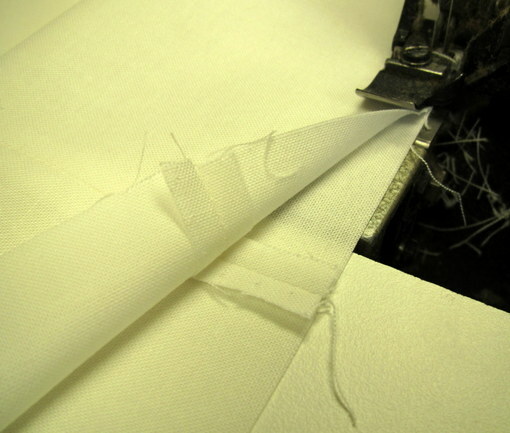 The last row is applied 1/2" from the top edge of the shade, just below the bias binding which finishes the top. 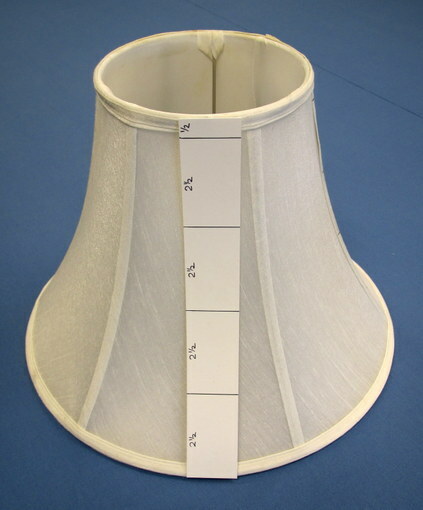 Measure the circumference of the top of the lampshade. Mine measured 20". 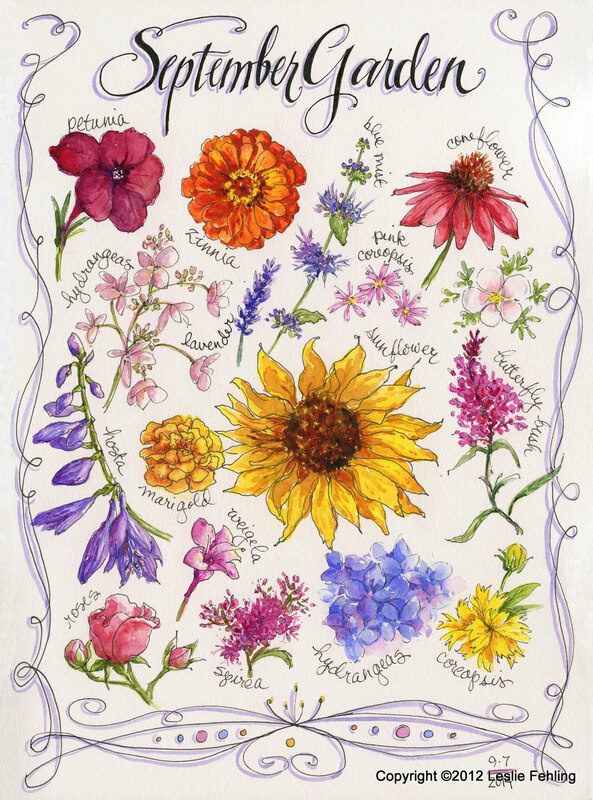 Make a sample rose to determine the size flower you would like to use for your border. 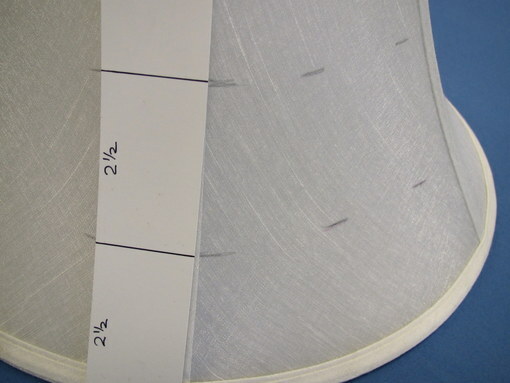 The ones shown here measure about 2-1/4" diameter. 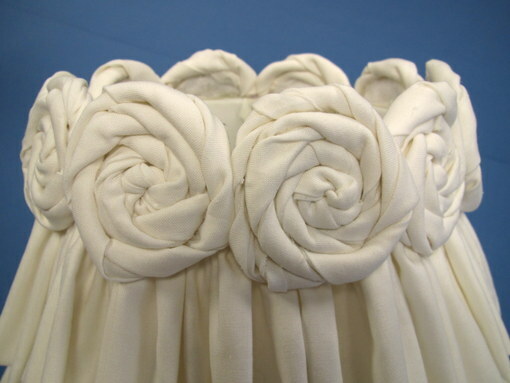 Divide the top of the lampshade into sections equal to the number of roses you'll be using. For my shade, I needed 9 spaces for 9 roses. I measured off sections which were approximately 2-1/4" for each rose. Note: You may want to make a few extra roses just to be sure you have plenty to choose from. They won't all turn out looking exactly the same, and you'll want to match the size and shape of the ones you use on the shade. 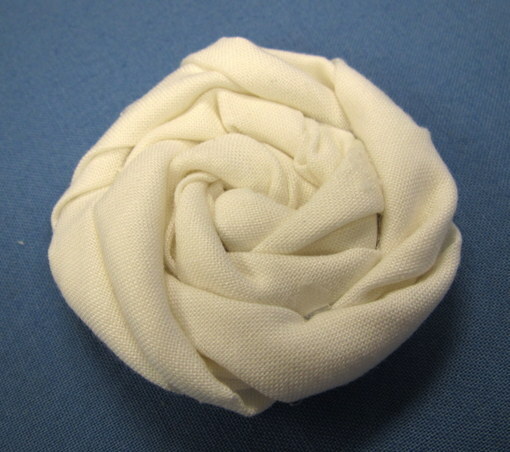 Cut a 1-3/4" diameter circle of felt for each rose. 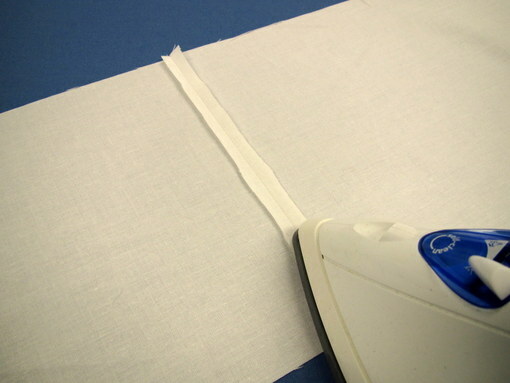 Cut 4" wide strips of lightweight fabric. It takes a piece about 20" x 4" for each rose. 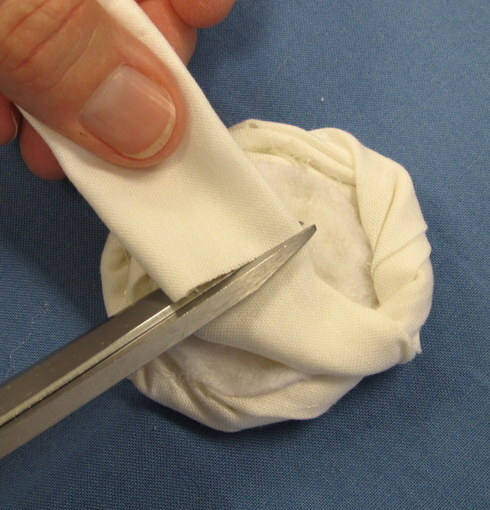 Fold the long raw edges toward the center, as shown above. 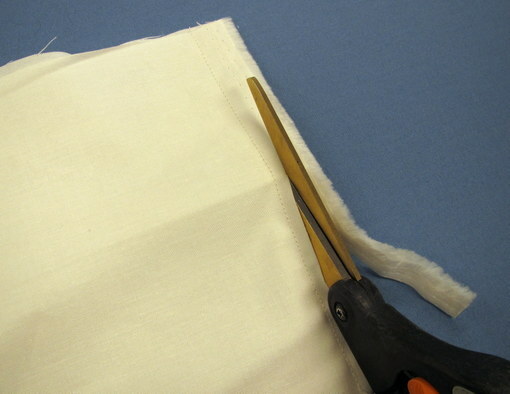 Then fold the fabric in half, lengthwise. 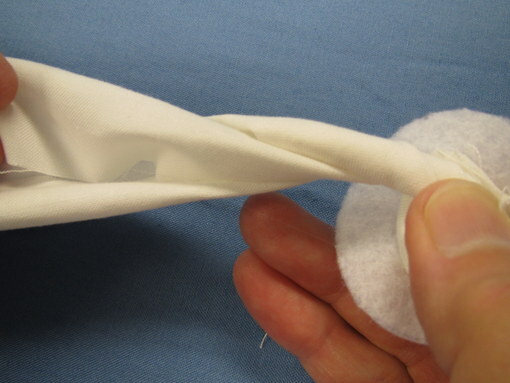 Begin twisting the end of the folded strip. 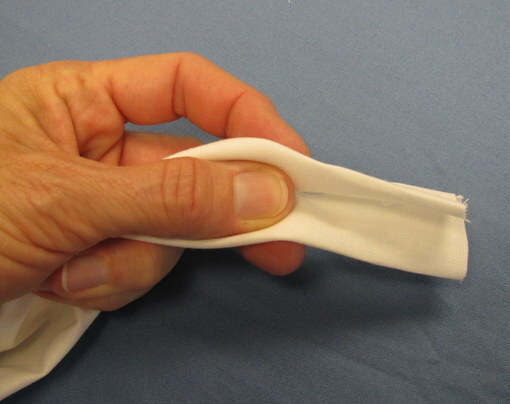 Continue to twist, and fold the end back on itself, as shown below. 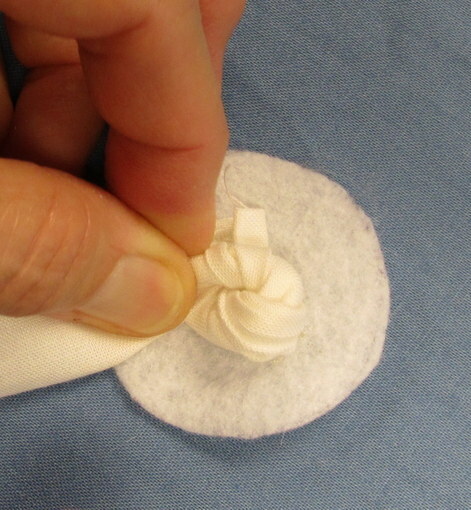 Place a 1/2" circle of glue in the center of a felt circle. 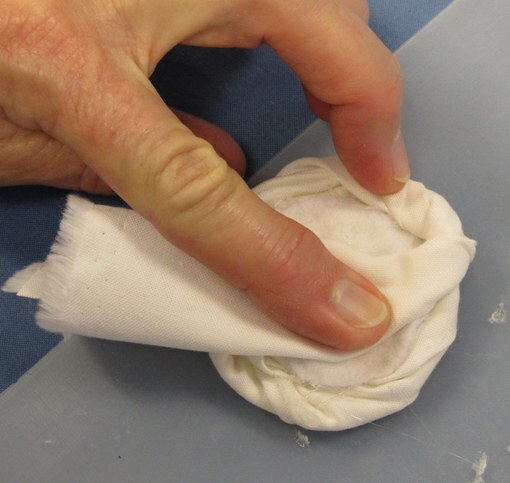 Continue to fold and twist the fabric, keeping the tightness of the twists fairly consistent. 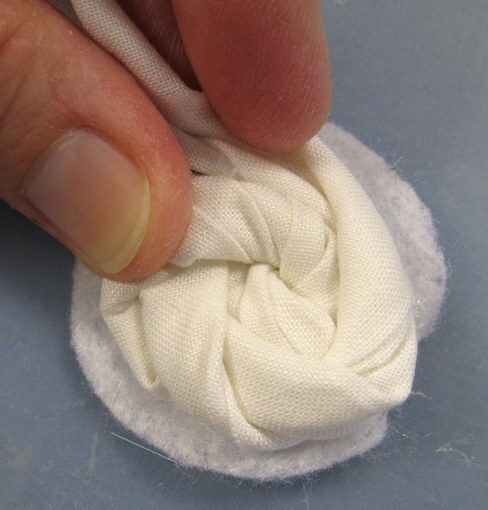 Continue gluing the fabric to the felt circle in a spiral, a little bit at a time. 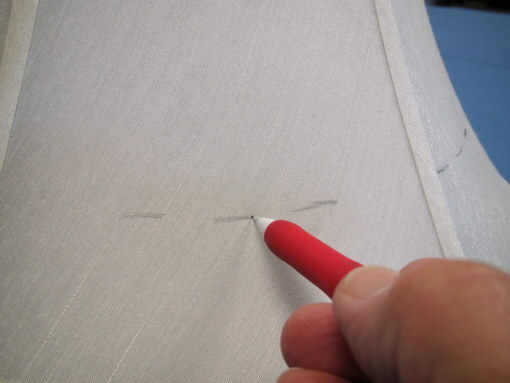 It gets trickier as you approach the edge of the felt. 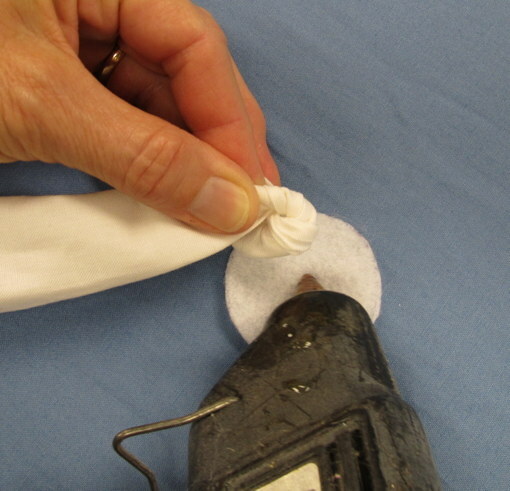 Keep the glue on the felt as long as you can. 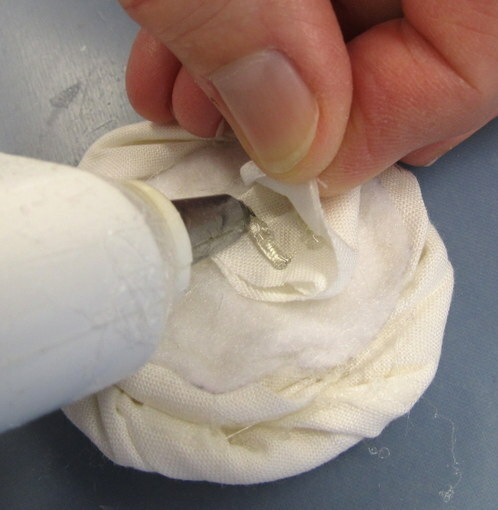 Continue around the rose one more time, applying glue to the side of the rose. This will give a nice finished edge with no felt showing. 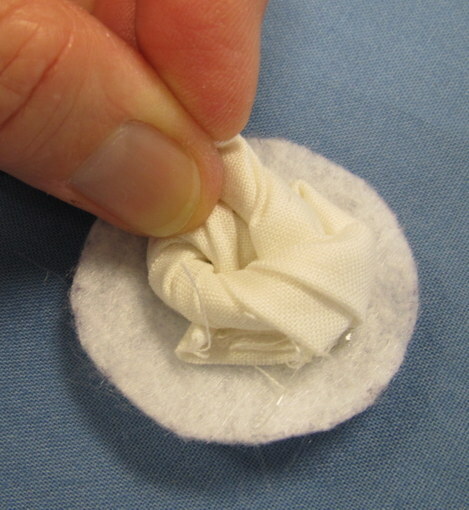 Twist the end of the fabric around to the underside of the felt circle and glue it in place. 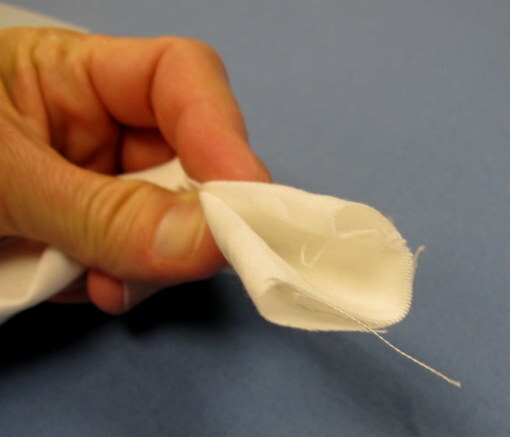 Apply glue between the layers of fabric at the cut end. Beautiful! Now it's time to apply the roses to the lamp shade. 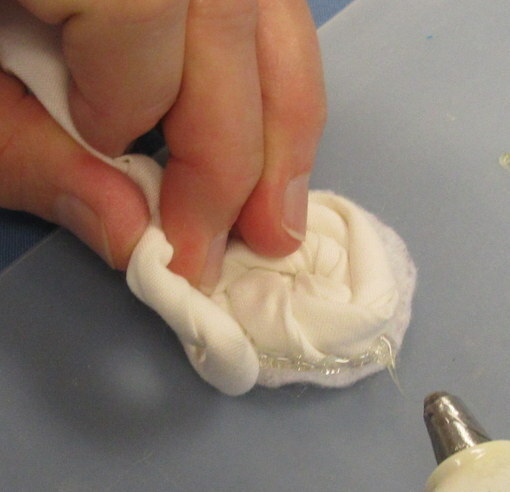 Apply hot glue across the center of the back of the rose. Press the rose into the marked position at the top of the shade. Some of my roses turned out slightly larger than the 2-1/4" diameter that I had planned, so I had to squeeze them a bit to fit them all in. To evenly space them around the shade top, I left spaces in between the first three that I glued on. Then I went back and filled in the spaces, nudging the roses up close to each other.